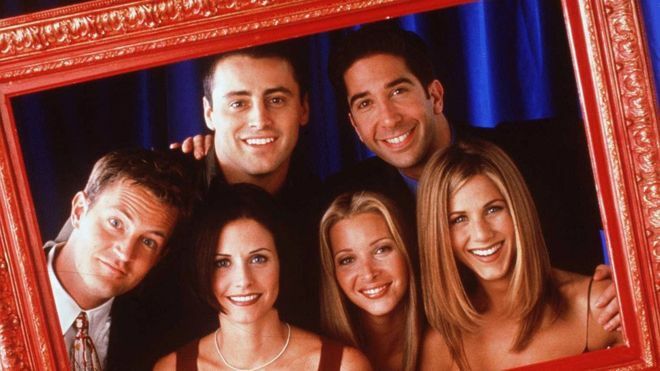 Friends, the US sitcom that finished almost 15 years ago, is still the favourite TV programme for young people in the UK, according to an annual survey of media consumed by the young. But it’s likely to be viewed on Netflix and many will be watching on mobile phones rather than a TV screen. Few of the five to 16-year-olds surveyed were even alive when the show was first broadcast, between 1994-2004. But the Childwise report says the comedy is their favourite programme. The show, about the ups and downs of a friendship group in New York, is now watched very differently from when it was first seen in the 1990s. The theme tune says “I’ll be there for you”, and for young viewers it is always there for them, available in back-to-back episodes on streaming services such as Netflix. Among those watching on demand, four in five are using their phones. Young people told the researchers that they liked the programme because of a combination of the subject matter and how they prefer to consume programmes. The “focus on friendships and relationships is relatable to teens”, say the researchers. And they enjoy working their way through episodes, with familiar characters, with the next starting automatically when one finishes. This 25th annual analysis of media habits, based on a survey of 2,000 young people, says this is now “generation scroll” – in which most viewing is through mobile internet devices, whether a phone, laptop or tablet computer. Only 10% now get “almost all” their TV programmes through a TV screen – and 58% of these young people watch on-demand programmes on their mobile phones. The report says even the concept of a “favourite programme” is being eroded, by what it calls a “glut of choice and the transient nature of content”. But when young audiences watch programmes from the 1990s there can be questions about changing social attitudes. On social media there have been long-running arguments about whether Friends has content that could now be seen as sexist or homophobic. It’s raised questions about how to judge programmes made a generation ago, but now available in the permanent present of on-demand viewing. But others have rejected such accusations as manufactured offence and say that it’s a comedy that has to be seen in the context of when it was made two decades ago. Friends was first broadcast in 1994 – four years before the launch of Google – but its current resurgence is based on an online, on-demand audience. The Childwise research shows young people immersed in digital technology – spending on average three hours per day online. Almost 40% are regularly using the internet when they are outside, as well as being connected at home. About seven in 10 of this age group had used Netflix in the previous week. YouTube is the most dominant website and the gateway to music and video, followed in popularity by Snapchat. But Facebook has fallen by half in the proportion of young people saying it is their favourite website, compared with last year’s survey. A quarter of these young people are in families with Alexa-style voice-activated computer assistants. But there are also signs of online fatigue. At the older end of the age range, among 15 to 16-year-olds, there were suggestions that teenagers wanted to “unplug”, with about three in 10 wanting to spend more time off the internet. Excessive use of social media was associated with loss of sleep, tiredness and also loneliness, as young people were spending a lot of time alone, even though they were “connected” online. “Children are more digitally connected than any other generation and more so than last year. Yet as connectivity increases, rather than feeling more linked to their peers, children are increasingly feeling alone and isolated,” says research director Simon Leggett.